I was invited to be a speaker at O’Reilly Where 2.0 Conference. It’s a conference mostly about mapping technologies, location-based services, and interesting new location-aware mobile apps. I spoke about RFID and NFC, in the context of the release of the new NFC-capable Android phone, the Google Nexus S. Having an RFID reader in a phone could cause a big change in how we interact with the world around us. 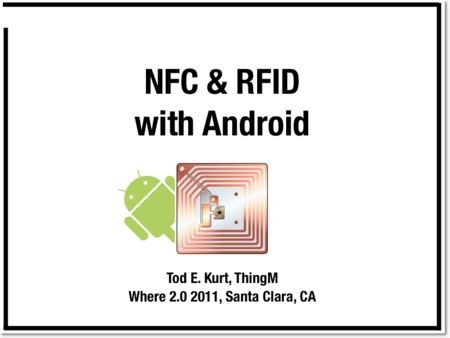 I talked about what RFID and NFC technologies are, how they work, some examples of them in the world and on Android, and how to add NFC capabilities to your Android app. And if the rumors of the new iPhone 5 are true, we’ll soon be awash in NFC applications. All BlinkM-family devices can have their firmware updated. 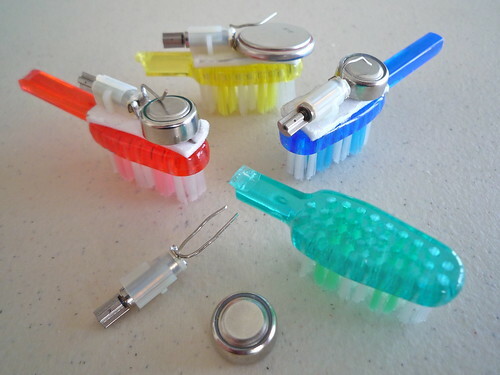 This makes them great for tiny development boards for ATtiny processors. ReflashBlinkM is an application that makes it easy to put back the original firmware or update a BlinkM to the latest firmware. 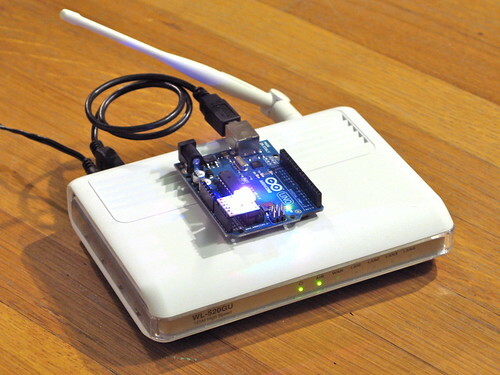 Previously you needed an AVR ISP programmer like the AVRISPmkII or the USBtinyISP. 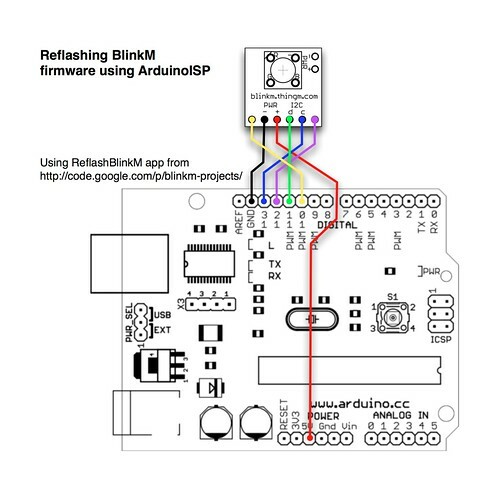 Thanks to the ArduinoISP sketch that ships with Arduino, if you have already have an Arduino, you can easily reflash your BlinkM with new firmware. 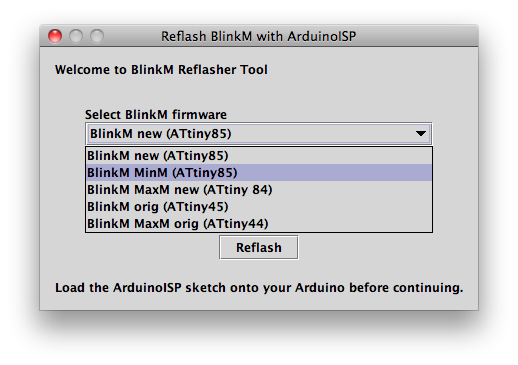 The ReflashBlinkM application is a tool for Mac OS X and Windows that uses ArduinoISP to help you reflash BlinkMs to their default firmware. For full instructions, see the ReflashBlinkM page in the blinkm-projects Google code site. At this years Sketching in Hardware conference, I gave a talk on the general approach I used to create LinkM, ThingM’s USB-to-I2C adapter for programming and controlling BlinkMs. I called it “Hacking USB HID for Easy Tethered Ubicomp” (4.8MB PDF) to give it a form that fit within some of the larger issues I’ve been dealing with in creating easily usable ubiquitous computing devices. USB has many different (and confusing) aspects to it. I’ve long advocated the creation of a set of libraries and patterns to make “driverless” USB a reality. A sort of training wheels for USB. At the time I called this USB on Rails”, poking fun at RoR. To me the key to this ease-of-use was the HID class in USB. No driver is needed when plugging in something like a mouse or keyboard. Other built-in device class drivers include CDC (modems), Mass storage, audio (headset), and video (webcam). While researching HID, trying to make LinkM a “USB on Rails” project, I found that the biggest hurdle was a consistent host-side USB API that would let one write one set of code that could easily be ported to Mac OS X, Windows, and Linux. Libusb works well enough for Unix-like OSes like Linux and Mac OS X, but the Windows variant libusb-win32 required a driver install. So I put HID away. For many months I investigated using CDC instead of HID because it maps down to a serial port on modern operating systems. Unfortunately, CDC has two main problems. 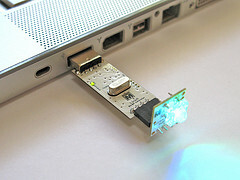 For the “serial port emulation” mode, mapping to serial port semantics is problematic for a USB device that can be removed at will. If a device is removed while it is still “connected”, the OS and application can get confused or crash. Also, the CDC driver implementation seems brittle on Mac OS X. Some CDC devices can work fine, others wouldn’t. I can see now why FTDI and similar vendors use a custom driver for their USB-to-serial chips. When looking back into HID after the frustration with CDC, I discovered that V-USB, the software-only USB firmware stack for AVR microcontrollers, had two interesting HID-based projects in them with a cross-platform host-side library for talking HID. The first was BootloadHID, a HID-based bootloader, and the second was “hid-data”, one of the examples. And there was a nice discussion of the platform differences on the V-USB wiki. With that, I took both of those projects, generalized them slightly, then specialized them for LinkM and made them the core of the LinkM project. You can view the resulting source at the LinkM Googlecode project. BristleBots and LED throwie art at Crash Space! 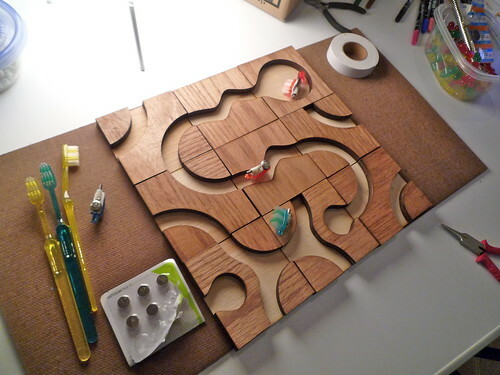 This upcoming Tuesday, 9 March 2010, 8pm at Crash Space in Culver City, we’ll be having some fun quick DIY projects for you to build. Come on over and have fun with us. The project kits are $5 for CrashSpace members or $10 for non-members and you can take them home after you build them. And we’ll be showing you how to build all of this, no previous experience required. 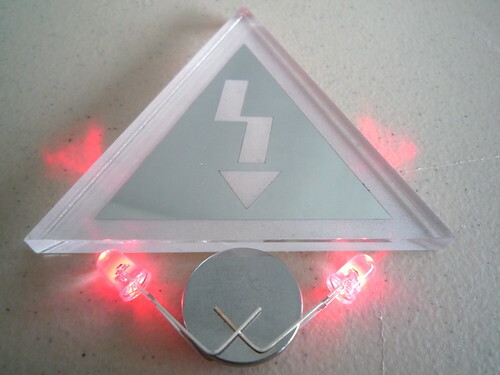 Come build bots and lights! A recent question from a friend who made a really cool BlinkM hoodie was: How can you turn a momentary button press into an on/off toggle? There are tons of ways to do this if you like getting into electronics. Most all work off of some flip-flop like principle. And while I could have suggested a true flip-flop chip, I thought it would be cooler if you could use a 555 timer chip (which contains a single flip-flop and a couple of comparators). 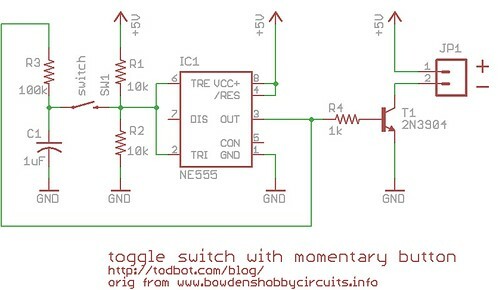 After scouring my childhood collection of Forrest Mims electronics books and a few 555 timer devoted websites (two of the best I found were: http://www.bowdenshobbycircuits.info/ & http://www.kpsec.freeuk.com/555timer.htm), I cobbled together the following circuit based off a few almost-what-I-wanted examples. The parts cost is pretty low. The 555 timer chip can be had for about $0.43, the 2N3904 transistor for ~$0.40, and various resistors & capacitors are essentially free if you have them. 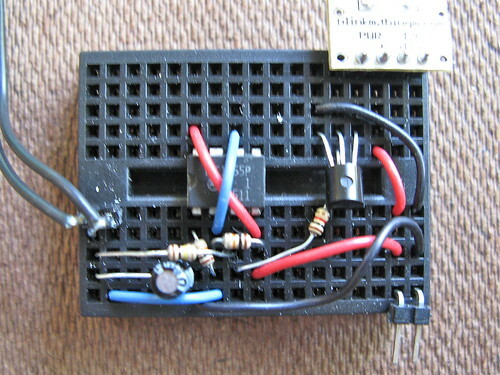 The circuit has 3 external two-pin connections: 5V&Gnd, button input, and the two pins of the thing to switch. In this case, the switched thing is a power supply to a BlinkM. 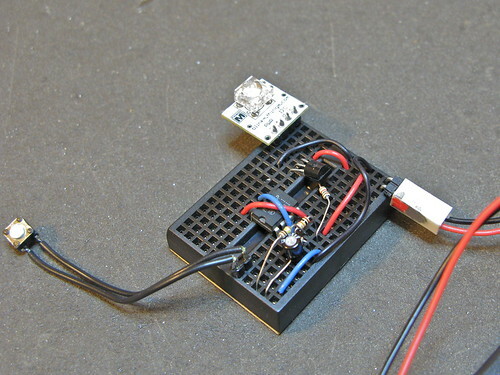 By changing the transistor to a beefier one, you can switch much larger loads. The little 2N3904 transistor in there now can switch around 200mA, but a bigger NPN or FET transistor and you could switch a few amps. It’s not the greatest for battery-powered applications. When “off” it draws about 4-6mA, depending on the brand of 555 timer chip you use. When on it draws that plus whatever power the switched device draws. Best to put a proper power switch on the battery pack to eliminate this quiescent drain.